Most history books deal with a historical place, period, person, or topic. 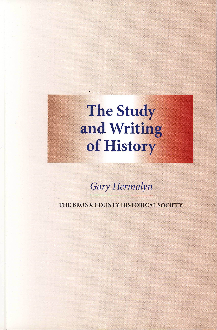 This work deals with the general problems of the historical method of research and writing. To study history and the technique of the historian is to attempt to understand the world and such study can easily move from the local to the international scene. But why do we study history? Because history concerns our lives, our time and our ability to make choices. History is an intellectual discipline and tradition, which enables us to use certain techniques to see relationships and forces at work. History is mostly written between the possible and probable truth. Lewis and Clark discovered Florida. Is this statement correct? Is this statement improbable? "Yes." Are there contradictions in documents? Well yes, in this case the evidence is clear that Lewis and Clark were among the first Americans to travel to the Pacific Ocean and not to discover Florida. So a conclusion is reached when you, the researcher, becomes so confident in your material that no further research is necessary. Keep in mind that there are two kinds of criticism, external and internal. External criticism is the accuracy of a document: does it fit its time and place, is it authentic? While internal criticism is whether the document is credible, can it be true? Historians must be objective. One must collect information and then do analysis. One cannot always tell what will be an historical event; even those present at the time of the event are not always correct. Future President John Adams, for example, wrote to his wife Abigail that July 2nd would be a historic day of celebration honoring the signing of the Declaration of Independence in the new country. And yet the real day of honor became July 4th. Another case is President Franklin Roosevelt calling December 7, 1941, when Japan attacked Pearl Harbor, "a day which will live in infamy." This date's meaning is now oftentimes forgotten. So while a historic event, it has lost its distinguishing characteristic. For what can we call September 11, 2001, but a day of infamy and the beginning of the United States' war on terror. A historian compares evidence and corroborates information, wherever one can. Each problem is unique. One good eyewitness is better than three unreliable, hearsay witnesses. Statistical sources are now readily available for quantitative methods of corroboration on virtually any topic such as population demographics, births and deaths, reading levels, voting records, etc. Through the use of data to confirm a hypothesis, perhaps through a quantitative analysis, one can correct, confirm, or even deny a position. When looking for historical documentation you must realize that 19th century historians were less critical. To solve such problems, get close to the sources. 21st century writers, on the other hand, are almost too critical. Again the sources are the key. Seeking fundamental similarities between the things that are apparently different gives you a hypothesis. While that original hypothesis may change as contrary elements crop up, you probably will begin to see a direction. But always beware of bias (do not be blind to facts, as this interferes with history by ignoring evidence and uses only material that supports you argument), ethnocentrisms, and oversimplification. How do we write history? A) What are historical questions- how are they formulated? B) What are historical techniques? C) What are historical sources and how do we locate them? D) What do we mean by written history? To explore these questions we will be alternating between theory and practice utilizing different exercises related to historical research and writing. They will provide the reader with a beginning foundation to understand the variations in history writing whether it is for a family history, a history of the Gulf War, the Renaissance, or you neighborhood's story. One needs to start at a specific point and bring forth your arguments in a logical manner to a conclusion backed up by evidence from the various forms of written records, oral traditions, media records, eyewitnesses, etc. Finally, historians should be impartial and fair. In the search for truth, be open it its results.